GM's Message, Great Bridges, Great Data, Great Advocacy! I hope this newsletter finds you well. 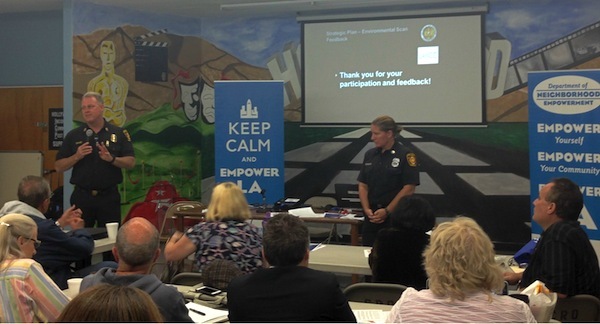 We've been reaching out to collaborate with various departments this past year, and our Los Angeles Fire Department reached out to us to see how they can work with Neighborhood Councils on the LAFD strategic plan. On Saturday, they were at the LANCC and on Wednesday, the HANC. They'll also be going to the other alliances as well this month. Please take a moment to tell them what you think the LAFD should focus their resources on and get the word out to your stakeholders to do so, as well. Speaking of strategic plans, on Sunday, I was happy to stop by the Mid City West Community Council's 1st Annual Harvest Festival. This was their first community event based on their strategic plan this year and was impressively put together in a month. Councilmembers LaBonge and Koretz, City Attorney Mike Feuer, LAPD, LAFD and other community partners were present to make the event a success. On Monday, the Budget and Finance Committee approved the new grievance peer panel system with an implementation date of July 1, 2014. This new policy is to replace the current grievance and complaint process for the Neighborhood Council system and was many years in the making. I really want to appreciate Councilmember Krekorian for leading in this effort when he was Chair of Arts, Parks and Neighborhoods Committee, Councilmember Parks, the Board of Neighborhood Commissioners and the Neighborhood Councils for continuing to push for a better way to address issues within the system. Next week, our offices will be closed on Monday for Veteran's Day and Thursday for a staff retreat. Have a great Veteran's Day weekend! Neighborhood Councils: Important to Weigh In "Officially"